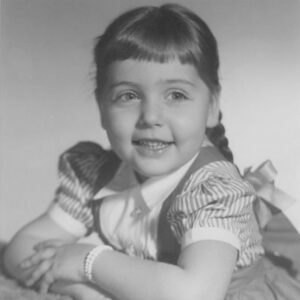 My love affair with jewelry began when I was about four years old. (This portrait of me taken then shows me wearing a two-strand white bead wrap bracelet, a complement to my girlish grin.) Where others might remember the treasured toys of early childhood, for me, it is the jewelry – a crystal heart on a silver chain, a red rhinestone strawberry brooch, and a garnet (my birthstone) ring – all pieces given to me by my great-aunt Esther, with whom I had a very special relationship. That is the way with love affairs, isn’t it? They begin with an uncomplicated love. And sometimes they determine one’s path in life – as you’ll see, I was destined to become a vintage jewelry collector. As I was growing up, Aunt Esther, a woman with her own sense of style, always marked special occasions with gifts of fine jewelry, each one appropriate to the milestone I was celebrating: a gold charm bracelet for my 13th birthday, a Sweet 16 charm for my 16th, and a gold bangle for my high school graduation. When I would wear her gifts, I always thought of her and of the significant moment in my life that she, through her gift, had recognized. She taught me there’s always more to a piece of jewelry than its sparkle. 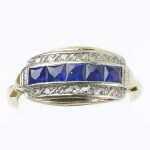 Jewelry has a special way of honoring the present and past. Also on my 16th birthday, I received my first piece of jewelry from another time: it was this Art Deco sapphire and diamond ring that had belonged to my mother’s younger sister who died when I was three. My grandmother had left it especially for me. I wore that ring every day for many, many years (I’ve had the shank replaced twice) and still wear it quite often. Although I always loved the ring for sentimental reasons, it was my study of the Art Deco design period many years later that revealed the ring’s richer story and deepened my appreciation. I became interested in vintage jewels because of this ring and two other family pieces Aunt Esther gave me: a Victorian brooch with seed pearls, and a magnificent Victorian gold watch on a long chain; both had belonged to her mother, my great-grandmother. The watch cover is engraved with our shared initials BS, so I have a feeling it was always meant to make its way to me eventually, for a time, too, and mark a connection to my maternal ancestry. I have passed the watch along to Aunt Esther’s namesake in our family, the next generation, and believe my dear great-aunt would approve. I had always collected jewelry, but in my 30s I really became a collector. When I started buying vintage, I bought Victorian and Edwardian pieces and then, inspired by my husband’s design passions as an architect, I became intrigued anew by everything Art Deco. Mad for research, my expertise grew over the years to include the best European and North American costume jewelry designed from 1920-1960. It was after officially retiring from earlier careers as a librarian and fee-based researcher (before the Internet! ), textbook editor, in-house records manager, and records management consultant that I turned my love for this jewelry and styling into a business. It’s a joy to apply my research and analytical skills to selecting and describing pieces for my website, and to writing and lecturing about the jewelry styles, makers, and the social and historical context of the times in which these pieces were worn. The retired librarian in me wants to tell the stories of these rare pieces. And, to the surprise of some, it’s the retired records management expert in me who knows just how to pair the right jewelry with the right outfit, accessorizing contemporary fashion with vintage. It’s not so surprising though – my entire career, people have hired me to figure out what should go with what. I would love to share my collection and my passion with you. Whether you’re a seasoned vintage collector yourself or you’re here shopping for something unique and beautiful, I invite you to browse the TruFaux Jewels boutique and see what era most speaks to you. Sign up for my monthly newsletter to receive my latest tips for mixing contemporary fashion with vintage jewels. If you would like help accessorizing an outfit for a special occasion, I would be pleased to provide my personal styling service. If you’re a bride-to-be, take a look at the vintage bridal jewelry collection. I especially enjoy working with brides and offer a styling service just for them. And if you’re looking for inspiration, my blog is full of styling tips and fashion history. Please enjoy!